From 17th July, 2012 it becomes a legal requirement when driving in France, to have with you, in the car a “NF” approved breathalyser. They can be bought on Brittany Ferries for a pack of 2 for £5.99 or at such outlets as Halfords and Motobitz. Motorists are already legally obliged to have a warning triangle and a fluorescent safety vest with them at all times and from July, anyone travelling through the country by car will also have to have one of the breathalyser kits so that they can test themselves to ensure they are under drink-drive limits. 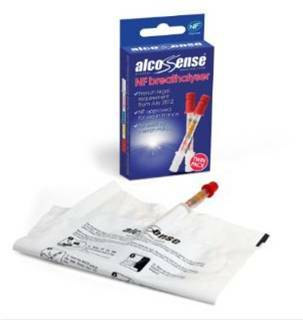 Police, however, will still use their own breathalysers to carry out any roadside test. Drivers who are caught without a kit will face a fine of 11 Euros (£9) but there will be a period of grace until November before French police start issuing the penalties. The French drink-driving limit is 50mg of alcohol in 100ml of blood - much lower than in the UK where the limit is 80mg. Motorists found with between 50mg and 80mg of alcohol in 100ml of blood can be fined 135 Euros (£112) and lose six out of 12 points on their driving licence. Above that, a driver could be fined 4,500 Euros (£3,744), lose their licence and be sent to prison for up to two years. In a recent article the FBHVC advised drivers of classic cars from the UK to take their V5 with them if entering Paris. The French Government has confirmed that cars over 30 years old are exempt from the new Paris Low Emissions Zone, but owners are struggling to get a grey ‘carte grise collection vignette’ or classic car sticker. The FBHVC is seeking confirmation of how UK classic car owners can get the sticker, as it is not at the moment available on line. The current recommendation is to take your V5 with you to prove the age of your vehicle. Thanks to John Legg DA7C for passing on the article. headlights adjusted to the right. The French have introduced a new law banning satellite navigation systems that show the actual location of speed cameras. Those caught can be fined 1,500 Euros even if the device is not in use. See additional notes below. Other countries in Europe have lesser sub-sets of the above so you will be covered across Europe if you take all of the above. · Specific locations are not available and a Danger Zone icon is shown instead. The length of the zone depends on the road type at the current location and can be 300m/2000m/4000m. · The location of the speed camera, if any, in that zone is randomized. · Download the one-time free download of a French Danger Zones file. This is for everyone even if you don’t have a subscription to the Speed Camera service. UK customers who are travelling in France should disable their French safety camera database before arriving on French territory. Instructions are provided on the website at http://www.garmin.com/uk/extras-camera-alerts/#france.